George Jacobs, who served as valet to Frank Sinatra for 15 years, died of natural causes on December 28th, 2013, at his home in Coachella Valley, reports the Los Angeles Times. He was 87. 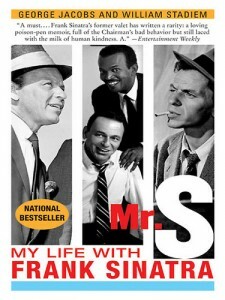 His 2003 book, Mr S: The Last Word on Frank Sinatra (aka My Life With Frank Sinatra), featured memories from his years with the superstar and his circle, including Marilyn Monroe. Jacobs mentioned that he was Marilyn’s neighbour for a few months in 1961, when she was living at North Doheny Drive in Los Angeles. Mr S was ghostwritten by William Stadiem, who also wrote Marilyn Monroe Confidential, the 1980 memoir of Marilyn’s former New York maid, Lena Pepitone. The depiction of Marilyn in Mr S – as promiscuous, and unkempt – is very similar to Stadiem’s earlier book, which some fans felt was a distortion of the truth. What comes across in Mr S is how boorish Sinatra and his ‘Rat Pack’ could be. Jacobs claimed that Marilyn was nicknamed ‘The Girl Who Couldn’t Say No,’ although I’ve never heard this mentioned elsewhere. Nonetheless, it’s difficult not to conclude that this fast-living, womanising scene wasn’t ideal for the more sensitive Marilyn. Jacobs’ association with Sinatra reportedly ended in 1968, after the singer found his valet dancing with Sinatra’s ex-wife, Mia Farrow, in a nightclub, and flew into a jealous rage. As with other former friends who had displeased him, Sinatra cut Jacobs off completely. ‘I had lost my best friend, my idol, my boss,’ Jacobs said. After the book was published, Frank Sinatra Jr denounced it as a ‘character assassination.’ However, Jacobs insisted that he was devoted to his ex-boss, visiting Sinatra’s grave every year.